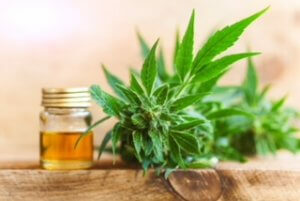 CBD, or cannabidiol, is part of a family of cannabinoids which are compounds found in the cannabis plant that has significant medical benefits. While cannabis has over 100 cannabinoids in it, the other major one you may know of is THC or tetrahydrocannabinol. The difference between the two is that THC will create a psychoactive effect (high feeling) and CBD has no psychoactive effect and will not get you high. CBD and THC are both plant derived cannabinoids or phytocannabinoids (phyto = plant) that have the ability to act on the cannabinoid receptors and cannabinoid receptor proteins that are part of our endocannabinoid (endo = internal) system that runs throughout the mammalian nervous system. The endocannabinoid system (ECS) was discovered in 1992. This discovery is as significant of a discovery as the lymphatic system. The ECS is involved in the regulation of a variety of physiological and cognitive processes. There are many therapeutic benefits of CBD. Clinical research has found cannabis strains high in CBD to be highly effective for patients looking for relief from inflammation, pain, anxiety, psychosis, seizures, and spasms. There is also research that reveals benefits for arthritis, diabetes, alcoholism, MS, opioid addiction, chronic pain, depression, PTSD and epilepsy. Finding the correct dosage for each individual can be a challenge since everyone is different; a certain dose may work for one may not work for the other. The scientific reasoning behind this is that CBD will bind to many different receptors throughout the body. At a low dose, it will bind to the receptors that most need it at that time or are most densely expressed. At a higher dose, those receptors can become saturated, so the remainder of CBD will interact with other receptor sites of different systems throughout the body. As practitioners we will start patients at a low dose and titrate up until we find the desired effect. Less is always more when it comes to CBD dosage. It all depends on the condition we are treating and the condition of the patient’s overall health at the time. Even though CBD is safe in high doses, there is also something called the bell curve effect. If administered at too high of a dose, you may start having less of a desirable effect. Again less is more. With the discovery of the cannabinoid system being fairly new to the research arena, we have limited knowledge of exact dosages and there are not standardized dosages per ailment. That said, each individual can monitor their ailments more easily by starting with a low dose. There are many different ways of administering CBD. First you have topical salves or creams, which you would rub directly on the affected area. The trans-dermal patches are also topical and are placed over the direct area. Vaporization is inhalation through the lungs. Sublingual tinctures are put under the tongue and absorbed into the blood. A pill or capsule can be swallowed and digested. CBD has a very low oral bioavailability rate. If swallowed as a pill or capsule the break down by the digestive tract will decrease the amount of CBD available in your blood stream and in turn decrease the desirable effects throughout the body. Depending on your targeted area, your practitioner will suggest the best route of administration. Sublingual tinctures, trans-dermal patches, and vaporization are the most desirable routes with the greatest benefits.